Lucy Swift has been let go from her job (downsizing) and caught her fiancé cheating on her. So she spends some time with her parents at an archaeological dig in Egypt then runs to Oxford to her loving grandmother to get some comfort and life advice. Except when she gets to her grandmother’s knitting shop she finds it closed and her grandmother has died. What?! But Lucy soon finds out that not all is at it seems and she must figure out what has happened or end up being the next victim. This is a cute (except for the murder part) paranormal cozy that will not tax your brain and leave a smile on your face. 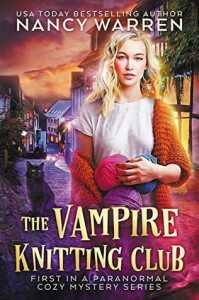 I love the vampire knitting circle. What a great concept! Easy to read with wonderful characters, I have a feeling this series is going to be entertaining and maybe have some romance since there are two potential suitors for Lucy. But I hope not too soon. She needs some space first. I will definitely be continuing with this series.